He traveled on horseback, and much of the time, he traveled alone. William Bartram was one of America’s earliest adventurer-naturalists, an unassuming Quaker who was something of a recluse. He shunned public accolades, yet he became internationally famous for his rich descriptions of the flora and fauna he discovered in the Southeastern wilds in the mid 18th century. Today he is considered the father of American botany. Born in Philadelphia in 1739, Bartram’s explorations occurred when the continent was still new to most European settlers, a paradise of plants and wildlife that hadn’t yet been discovered or named. At the time, botanical findings were far more important than merely locating a new ornamental for the garden. The formative nation’s economy was largely dependent on what was grown on the land, and plants and their various uses—from food to medicine to clothing—were of significant socioeconomic importance. In that momentous time, Bartram made enormous contributions to science by simply doing what he loved best: hunting for flowers. His Southeastern travels began in 1773, and over the course of five years, he traveled 2,400 miles, exploring parts of Florida, Georgia, Alabama, Louisiana, and the Carolinas, collecting, recording, and rendering illustrations of his finds. In the spring of 1775, his journey brought him to the mountains of Western North Carolina. Bartram’s love of nature had come to him by birthright. His father, John Bartram, established the first botanical garden in America on his farm near Philadelphia in 1730, and later served as the colonies’ Royal Botanist for King George III. His colleagues included such notables as George Washington, Thomas Jefferson, and Benjamin Franklin, with whom he cofounded the American Philosophical Society in 1743. 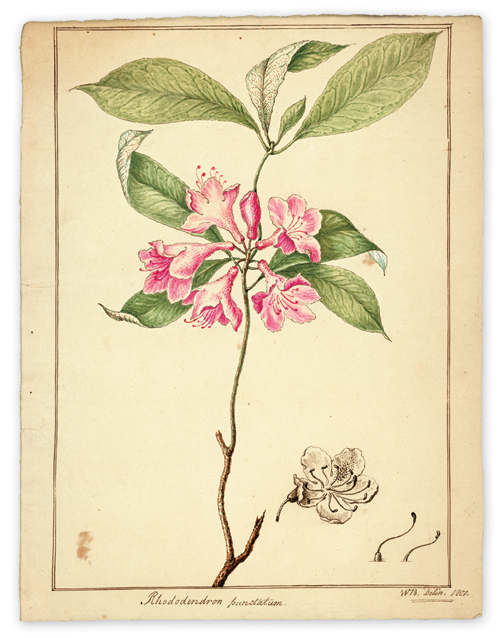 “Botany and drawing were his darling delight,” the elder Bartram once said of his son. Early on, William’s artistic abilities became evident. He received a classical education, but was largely self-taught when it came to art. Still, he was so good that he caught the eye of Benjamin Franklin, who proposed that the young William apprentice under him as an engraver, an offer Bartram rejected in favor of other pursuits, namely the mercantile business. Bartram spent much of his 20s striving for success as a merchant, first near his uncle’s coastal North Carolina plantation, Ashwood, and later in Philadelphia. Though botanical excursions around Ashwood and a plant-gathering trip to Florida in 1765 helped prime him for the next chapter in his life, by 1770, Bartram was nearly bankrupt and returned to his family’s nursery near Philadelphia. Shortly thereafter, he was hired by Dr. John Fothergill, one of the world’s foremost botanists, to search the Southeast for native species. During his expedition, Bartram chronicled some 358 species, 150 of which were new to science at the time. Yet it wasn’t the scale of his findings so much as the way he wrote about them that brought him acclaim. Perhaps due to his Quaker upbringing, he believed that “the immediate finger of God” was at work in every flower and that “a portion of universal intellect [was] diffused in all life.” As a result, Bartram’s accounts of his travels were both descriptive and inspirational. His writings also helped change attitudes about Native Americans. Bartram lived with the Seminole, Creek, and Cherokee, learning their ways. His descriptions of their tribal life and culture showed, perhaps for the first time, that these were not hunter-gatherer savages, but intelligent, sophisticated people who lived in complex societies. Bartram’s chronicles of his journey through the Southeast may have often been lyrical, but he never steered far from his main goal—the study of botany. He would wax poetic about a particularly stunning view, but follow that with a description using the Latin nomenclature of the flowers, plants, and trees in the area. While Bartram stayed in the mountains for only a month, he would remain in North Carolina for another seven years, working on his findings at his uncle’s plantation before returning to Philadelphia to continue his father’s work at the nursery. He spent the remainder of his life devoted to study, illustrating botanical discoveries and working tirelessly on new findings. He continued literally until the day he died—July 22, 1823—when an aneurism took his life only minutes after he’d been writing a description of a plant. Bartram never married, but the legacy this gentle, thoughtful man left is as timeless as the mountains he so eloquently described. Today, the North Carolina Bartram Trail Society keeps the botanist’s joy of noticing and noting the wonders of the natural world alive through a memorial trail that follows, as closely as possible, the route he traveled in the state. In the opening sentence of Bartram’s Travels, his popular account of his journey through the South, he wrote that the world is a glorious place, “furnished with an infinite variety of animated scenes, inexpressibly beautiful and pleasing, equally free to the inspection and enjoyment of all his creatures.” Indeed, we are blessed that in Western North Carolina, much of what Bartram saw and admired still remains, awaiting our own inspection. The North Carolina section of the Bartram Trail begins on the N.C./Georgia border and winds northwest to Cheoah Bald, traversing Wayah Bald, the highest point on the path at 5,342 feet. Maintained by the North Carolina Bartram Trail Society and blazed with yellow rectangles, this 74-mile section can be tackled in small segments or in full. A 50-mile loop that connects with the Appalachian Trail is also an option. For more information and trail maps, visit ncbartramtrail.org.